— or as in some cases, have recently changed direction entirely! Here’s a progress update on a few previously-reported projects. A GERMAN GUMSTUMPER GETS A FACE-LIFT! Bahnhof Sanspareil (Oberfranken) by Alexander Kaczmarek, who lives in Berlin, is a European variation of the Gum Stump and Snowshoe RR . 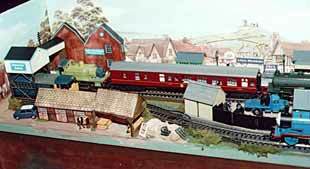 Since we last visited, Alexander has added considerable scenic detail and replaced two turnouts with a turntable. As a result, he remarks, “Switching is now more exciting.”He’s also extended the layout length slightly to 200×43 cm (79×17 in). 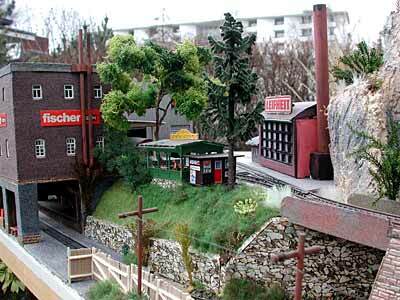 Scale is Märklin HO. Compare this version with our first report of this nice little line set in northern Bavaria in the 1980s. Progress in this case means more details and improved operations. 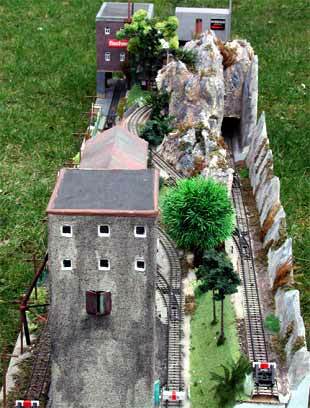 From Shortliner Jack Trollope, in the Highlands of Scotland, comes not one but two updates of layouts he’s featured elsewhere on this site. The first is an idea for amending Boxer Shortline, which itself was a variation on Jack’s original Box Street Yard.Jack comments, “Boxer Shortline becomes a bit longer — though shorter than my original, and only needs an Atlas 19-degree crossing to gain operations (an additional spur for switching). Sector plate must hold the loco + a 40 or 50 foot car, depending on the needs of the user.” Progress here means adding track capacity and new switching locations.Meantime, the guy who designed and is building Boxer Shortline (under the new name, Las Cajas Avenue) has released a new progress progress photo of the line (below), updating our last report. 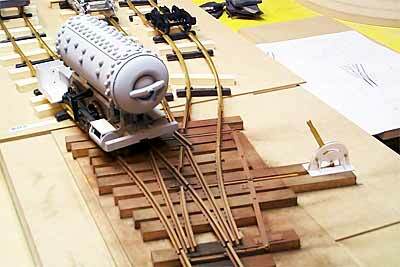 Jeff Hartmann, from Long Beach, California, is packing a lot of details in a three-foot HO layout! You can follow Jeff’s progress on his web site. Shortliner Jack’s second update is the Avery-Labelle Mfg. Co. (Mark II). 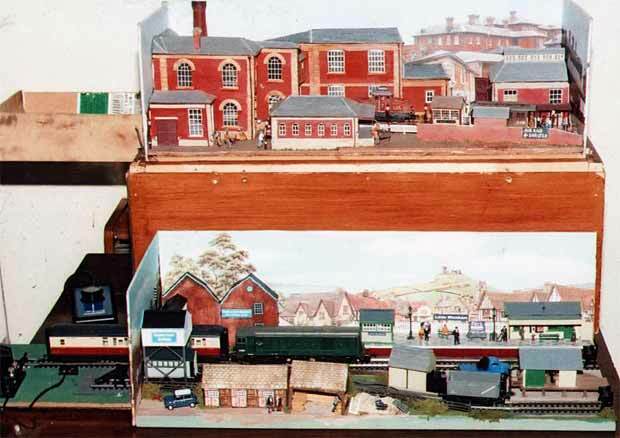 This remarkable little layout fits on an A3 sheet of paper (about 16.5×11.7 in) and provides a nearly complete range of operations in the yard outside the A-L manufacturing plant.What’s missing? Jack comments, “If I had added a cut-down Atlas 90-degree crossing, the unorthodox traverser could be used in two directions, allowing the tracks in the building to be ‘fiddled with’ as well.” And switching of cars within the building leads to such operations as “empties in-loads out” and many other variations of operating patterns. 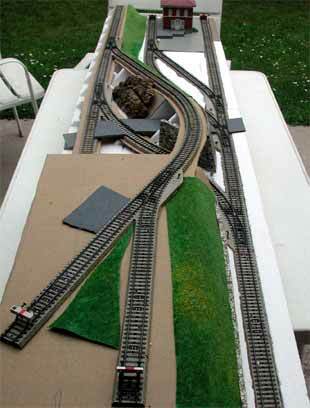 A simple addition that adds considerably to the layout’s potential!Progress here means an amazing increase in flexibility by adding just one little piece of track! GIANT TRAINS FROM CANADA RUN WILD! 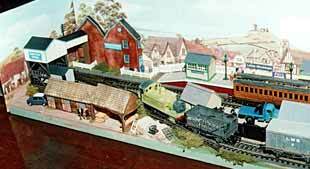 When we first visited Michael Mott from Alberta, Canada, last December, he was in the middle of building several layouts, all of which have changed direction since then! 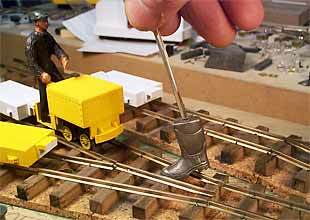 First, Michael’s 1:10 scale layout where 30mm equals one foot, has been changed drastically. 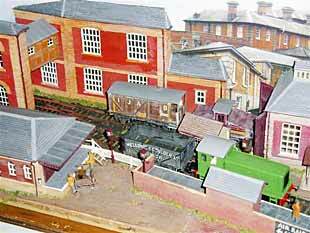 “I have revised the plan to create a 30mm scale Inglenook within a space of 70 by 19 inches,” reports Michael. “It all hinges around a three-way frogless stub switch that works beautifully. I am really pleased with the way it operates.” (This photo shows the three-way stub switch, a mechanical marvel built to the gauge of 3.5 inches.) The loco is Michael’s work in progress, a compressed air loco that was used in Alberta and is preserved in Banff National Park. And all this is under six feet long!! Michael is also building several Gn15 layouts — G-scale trains running on HO gauge tracks (representing 15″ gauge industrial railways). Shown here is his Kick Switch Layout, which not only has no curved track at all, but uses authentic mining turnouts with single points that are kicked to one side or the other to facilitate switching!The staged photo at the right illustrates how the kick switch works. 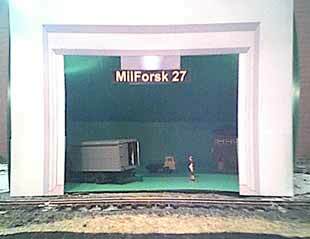 The locos are various mining lokeys that Michael is building for this 29×9 in layout! See more at his web site. 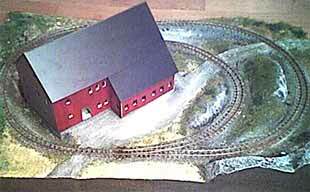 We’ve previously visited Ubergsmoen Industries, a micro layout being built by Jon Songøygard, who lives in Arendal, Norway. When last seen, the layout looked like above left. 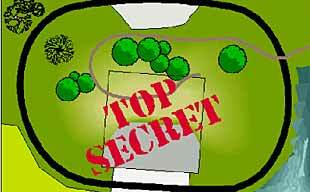 But since then, Jon has changed direction entirely, removed the center of the track oval — and is converting the layout to a sort of “rectangular pizza”.Heart of the new scenic development is a “top secret” military research installation that Jon is designing to experiment with forced perspective — fooling the eye into seeing more distance than is really there. His original sketch is below left — people and materials become smaller as they recede from the front, so that a short depth of the concrete building appears like a giant chamber.Lower right photo shows an early mockup of the concept — this scene is only about 8 inches deep, but using N scale trucks in back and HO trucks in front makes it look much larger! 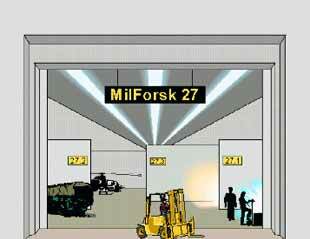 I’ll look forward to seeing how Jon’s idea works out when he sends photos of the completed “MilForsk 27” (“MilForsk” is abbreviated Norwegian for “military science”). The link for Jon Songøygard’s web site no longer works.